Dr. Ian Fairlie is an independent consultant on radioactivity in the environment. He studied at Imperial College & Princeton University. Ian headed the Secretariat of the CERRIE Committee on radiation risks & has been a consultant to the European Parliament. 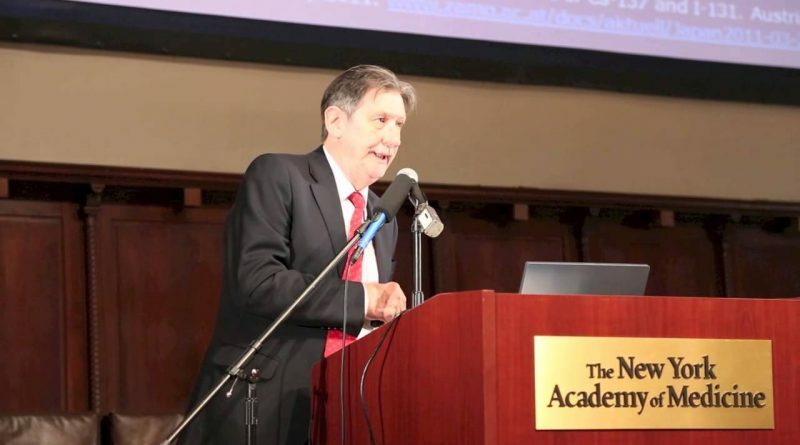 He has an in depth knowledge of the dangers of radioactive materials and processes involved in the fracking industry and in March 2019 he gave a guest talk at one of our public meetings. Ian’s presentation can be downloaded as a PDF file here or as a Powerpoint slideshow here. With the recent fracking at Preston New Road in Lancashire and the press coverage about the seismic activity it has been causing we’ve added some resources to cover this topic. Earthquakes around the British Isles in the last 100 days; a database maintained and managed by the British Geological Survey. There is a system in place which dictates how fracking companies must proceed when they cause seismic activity, this is called the Traffic Light System. In April , a tremor measuring 2.3 on the Richter scale was felt in the Lancashire seaside resort [Blackpool], followed by an event in May that measured 1.5 on the scale. “It is highly probable that the hydraulic fracturing of Cuadrilla’s Preese Hall-1 well did trigger a number of minor seismic events,” Cuadrilla admitted. The government is seeking views on the principle of granting planning permission for non-hydraulic shale gas exploration development through a permitted development right. The purpose of this consultation is to seek views on the principle of whether non-hydraulic fracturing shale gas exploration development should be granted planning permission through a permitted development right, and in particular the circumstances in which it would be appropriate. The consultation survey can be accessed here. There are some excellent guidance notes for answering the questions which can be found here. Thanks to Frack Free United for these. This initial consultation is intended to gather views from industry, regulators and other interested parties on the timings and criteria for including shale gas production projects in the Nationally Significant Infrastructure Project (NSIP) regime under the Planning Act 2008. Although an American study in Pennsylvania this report on the ‘The Social Costs of Fracking‘ makes interesting reading with regard to the effects of fracking outside of the environmental arguments. Our team at BAF have some great experience writing letters to councils, planners, politicians etc. It is vitally important that as many people as possible write to those in power to make sure they understand the opposition to, and dangers of, fracking. To help you do this we have some template letters available below. Here are some links to other groups and communities that you may find helpful.